Make your kids the cool of snack with these homemade chewy granola bars! This is all about keeping snacktime healthy! As a kid, I used to LOVE those chewy granola bars. What was your favorite flavor? Mine was a toss-up between the smore’s and the peanut butter chip. 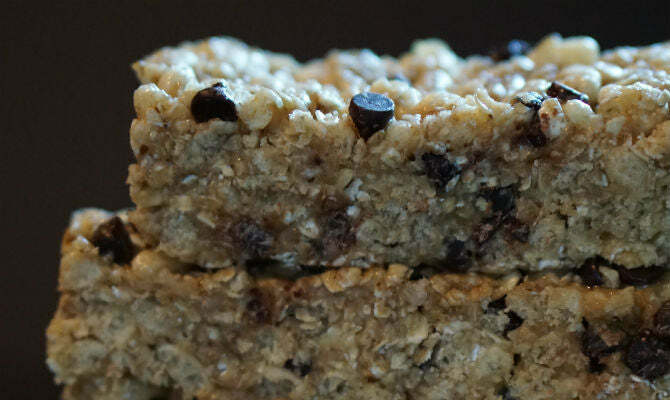 These granola bars include gluten-free quick oats to give density and chewiness to the bars. Quick oats are a great source of carbohydrates. The carbs help replenish glycogen stores, giving you energy, which makes it a perfect pick-me-up snack! This would even be a great snack to pack in your gym bag as an effective post-workout meal. Add some protein, like a Sunwarrior protein shake, and you are good to grow! To give the granola bars some crunch, the recipe includes gluten free rice crisps. This keeps the recipe light and calorie friendly for those concerned with macro breakouts. These bars are naturally sweetened, unlike those highly processed ones you would find in the store. The recipe uses brown rice syrup and honey, although you can certainly use maple syrup to keep it vegan. Coconut oil is also used as a binder. For this reason, these bars are best kept intact in the refrigerator. Coconut oil is really unique because it expands as it cools. If left out on the counter for too long, the binding will start to break down and the bars will fall apart very easily. They are best consumed soon after taking them out of the fridge. Check out the add-in options to customize the flavorings! Mix rice crisps, quick oats, and salt in a mixing bowl. Set aside. Combine brown rice syrup, honey, nut butter, coconut oil (already melted), and vanilla extract in a small saucepan. Lightly melt the wet ingredients together on low heat for a few minutes. Pour the melted wet ingredients onto dry ingredients. Gently stir to fully incorporate everything together. Mix in add-in ingredients at this time. Gently stir again to evenly distribute the add-ins. Pour granola bar mixture into a shallow pan, or container. Press firmly to flatten the granola mixture. Should be about 1 inch thick. Refrigerate for at least an hour. At this point, you can flatten the mixture again by pressing firmly. When ready to serve, cut the mixture into 1 inch slices. Enjoy!